A £1m safety centre in Belfast is set to close as the PSNI have said they cannot afford to fund it. The Risk Awareness and Danger Avoidance Responsibility Centre (RADAR) only opened in 2015. It has been used to teach tens of thousands of children and young people about road, fire, home and transport safety. It is understood RADAR costs about £500,000 a year to run, with the PSNI as its biggest funder. In a statement, PSNI Chief Constable George Hamilton criticised the "the lack of cross-departmental responsibility" for the centre. 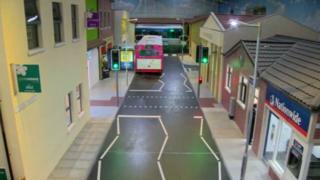 Radar has a life-size model street, bus and train stops, police station and a courthouse and is one of the most advanced of its kind in the UK. However, the building which houses it is privately owned. BBC News NI has obtained correspondence between Mr Hamilton and the civil service regarding the centre. In a letter written on 9 August to the head of the civil service, David Sterling, the chief constable said that a review of the centre had concluded that it was "not appropriate for the PSNI to continue as sole funder," and that it should be paid for on a cross-departmental basis. He said that as the PSNI was facing unprecedented budget pressures he "simply cannot countenance signing up to a further five years of RADAR where we could find ourselves liable to an annual shortfall of £200,000, similar to what has been witnessed this year". He concluded by saying that the Departments of Health, Education or Justice should take over primary responsibility for RADAR. In response, on 29 August the Department of Justice made an offer to fund the centre for up to £400,000 for 2018/19 to "allow time to properly consider longer term funding as well as new management structures and accountability issues". However, the chief constable replied on 31 August that the department's one-year offer provided "insufficient assurance" to sustain the centre. "It is therefore with regret that I wish to inform you that the PSNI has now proceeded with exercising the break clause in the lease and is preparing for the decommissioning of the site, which we will vacate by 31 March 2019," his letter concluded. In a statement to BBC News NI, the chief constable said that the centre was not financially viable and that the collapse of the executive and political uncertainty had hindered attempts to secure its long term funding. "For several years I have had numerous conversations with colleagues in the Department of Justice and the Head of the Northern Ireland Civil Service regarding the future sustainability of the RADAR Centre," he said. "I have raised significant concerns regarding the ongoing and unreasonable financial burden this has placed on our budgets and the lack of cross departmental responsibility associated with its operation." "For almost five years we have been funding the centre in an unsustainable way. "This is not just about cost-cutting, it is not just about governance but it is also about the ability of government in Northern Ireland to share partnership responsibilities." The centre has 12 staff, all of whom are expected to be redeployed. However, one who spoke anonymously to BBC News NI said that the young people and vulnerable adults who visited the centre would be the people who would suffer most if it closed. They also said that the legacy of educating people about road, transport and home safety would be lost.